It's the platter to end all cheese platters -- except of course that it's not. Today I am celebrating (drumroll, please) my 365th cheese! I've totaled 366 postings -- 365 cheese and 1 butter, and I've certainly learned a lot more about France and French cheeses than I expected. 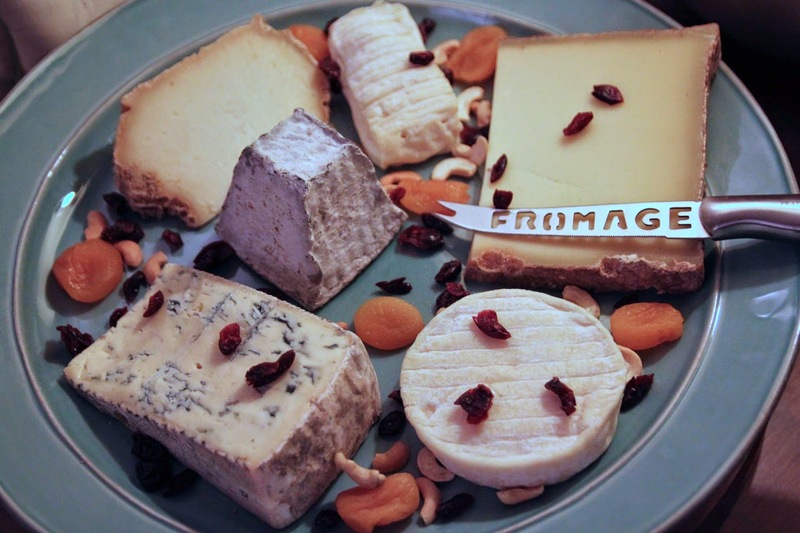 Though I'll be continuing my Year in Fromage even after my year is up, I feel this is the day to answer an oft-asked question: What cheeses would I choose for my fantasy cheese platter? Keeping in mind the general "rule" -- at least one blue, sheep, goat, cow, hard, and soft -- and my own belief that there should be a variety of shapes and colors as well, I could come up with dozens of "perfect" platters at this point. But only one fantasy platter -- full and abridged. My two blues: Bleu de Severac (the most perfect blue in the history of blues: sweet, nutty, salty, creamy) and not just a plain Roquefort (not that I'd complain) but a Roquefort Pâte de Coings. 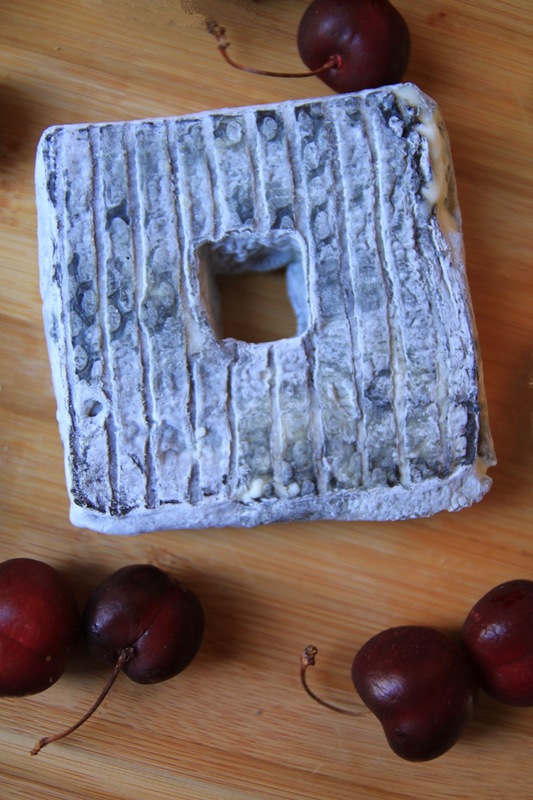 The cheeses my family calls "Moldy Donuts" -- exquisite, oozy, moldy goats: Saint Clémént (square, goaty, creamy, ashed) and Anneau du Poitou (oozy, practically melted texture, delicate, butter-salty). A hard sheep and a goat: Lavort (served with a great cherry spread, ideally the fruit gels from Quatrehomme) and Tomme Vieille Chevre (crumbly, salty, like Parmesan). Creamy cow cheeses: Affidelice (for my one really strong foot-fungus stinker), which is just a little sweeter and milder than a raw Epoisses or Chambertin, though these would also work in a pinch; Crémeux de Bourgogne (texture somewhere between creamy and a cloud). And two more unusual soft goats: Le Boucanier Chèvre Fumé (creamy and very smokey, for a little oomph) and Trianzac Chèvre aux Graines Grillées (a goat of perfect salt and cream, with the added bonus of the beautiful and nutty grilled seeds). I'd put out Comté (a highly aged, super tangy one), though mostly for the kids. That might give me some hope of getting more of the Gouda de la Citadelle d'Arras for myself (of all of the cheeses, this one is most like candy to me: sweet and nutty). Full disclosure: I'm including the Lavort mostly to make sure to have a sheep cheese, and as a vessel for cherry topping. The cheese alone is excellent and delicious, but not necessarily at fantasy platter level for me. Needless to say, they should all be unpasteurized and, ideally, farmhouse or artisanal versions. I seem to like my red platter best for taking photos, and for serving cheeses, though the blue one is bigger and, therefore, handy. But I have to say that I rather enjoy my new, gray platter -- found at a Parisian garage sale -- which has a very convenient handle in the middle. This will probably always remain a virtual platter for me, for several reasons. Not all of these cheeses will be found in the same store at the same time. Some of them, I'd be lucky to get at any time, let alone on command. Plus, I have 135 more cheeses to taste to get up to my next milestone of 500, so there won't be too many repeated cheeses. But the beauty of living here is that I can all of buy them again at some time or other. And believe me, I will. Chèvre is a goat cheese. Simply that. It's the word for the animal (la Chèvre) and also the cheese made from her milk (le Chèvre). And yes, that gender thing bugs me. A Chèvre can be raw or pasteurized, farmhouse, artisanal, or sometimes industrial. It can be young or old, ashed or plain or coated in herbs or orange mold. It can be shaped like a puck, a tube, a triangle, a pyramid, a cube, a heart, or just about any other shape that doesn't require the skill of Michelango carving the David. In short, it's barely a cheese at all -- more like an infinite number of cheeses. Literally infinite. But still, you can buy it at many stores and nearly all farmers markets. That's because many of these goat cheeses are made in small batches and not given a particular name. The farmer just doesn't bother ("Sure, I could name it 'Le Magnifique' or I could just call it 'Chèvre'. Yeah, that seems easier."). This means that it can be a real grab bag of pungency and potency. Be brave. 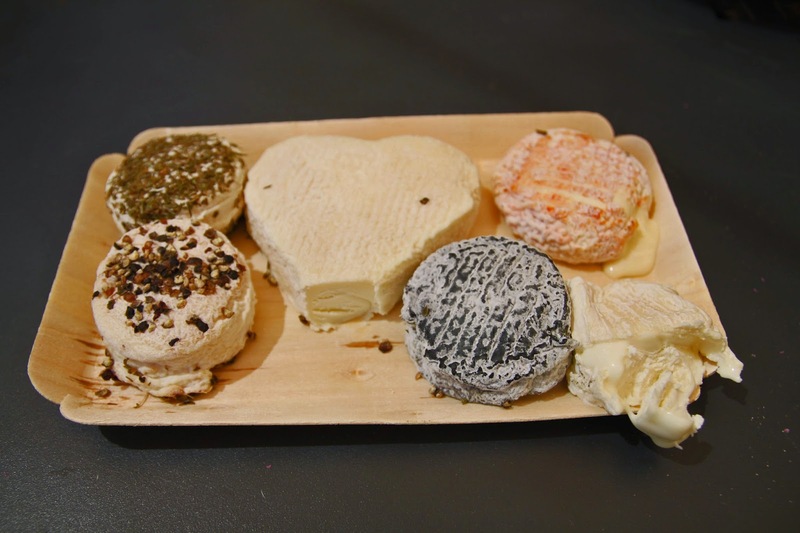 As Chèvre is also a larger category, these specifically-named cheeses are all Chèvres, too. And I could have come up with at least a hundred more that would fit the bill. But they are not just Chèvres; they have individual names that merely contain the word "Chèvres". This is (these are?) a goat cheese with one common name: Fontenille. Yet just look at how drastically different they are, depending on how long they've been aged. And yes, even the tall skinny one is just a young version of the same cheese, before it smushes down in the aging process. And the black one is not just aged but also ashed. This is cheating, in a way, because Chèvre is such an incredibly general name and vast category. But I decide it's not completely cheating, because you will, indeed, find many, many cheeses named simply Chèvre, especially at farmers' markets. You may not know exactly what you're getting into, but with a practiced eye, you can have a good idea. In any event, to me the ultimate cheese platter would have several great goat cheeses, and if I really had to (twist my arm), I could be perfectly content with a cheese platter of nothing but cheeses named simply "Chèvre". Goat cheese is, without any doubt, my favorite category of cheeses and is the section in the store that most makes me drool. All the best, fingers crossed, you get the drift, right ? Congrats, Kazzer, on 365 days of hard work and great writing and beautiful photography!